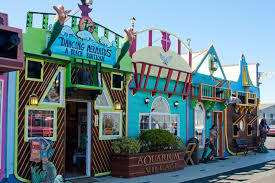 The Aquarium Village offers a unique blend of family style shopping, dining and entertainment. We are a community that is dedicated to creating an unforgettable experience, an adventure for the whole family. Spend the day strolling through our open promenade shopping through a diverse variety of stores, gift shops and art galleries. Enjoy a meal at one of our exquisite restaurants. Our family friendly amenities include an indoor bounce house and play area. Stop for a photo op with one of our amazing nautical themed cutouts and statues. There are treasure to be discovered everywhere at the Aquarium Village!